California's Central Valley is plagued by poverty, unemployment, pollution, and high rates of youth incarceration. For most kids who grow up there, the goal is to get out. But this summer, 25 UC Santa Cruz and UC Merced students turned that narrative on its head and returned home, eager to give back to their communities. Through the nonpartisan Central Valley Freedom Summer project, students spent three months empowering youth. They interned with community organizations and reached out to high school students to register young voters and teach them about civic engagement. They hosted youth summits, conferences, and workshops about grassroots organizing. They sponsored art events and mural paintings, all with an eye toward beautifying their hometowns and energizing underserved residents. Modeled after Freedom Summer, the Mississippi voter-registration drive that began in 1964, Central Valley Freedom Summer was the brainchild of Veronica Terriquez, an associate professor of sociology at UC Santa Cruz whose research focuses on youth civic engagement. In the 1960s, young university students from all over the country, but particularly the Northeast, flocked to the South to support the Civil Rights Movement. But many of the students were outsiders, and they didn't have deep ties to the community. When they left, they took their energy and talent with them. Terriquez wanted to support a different movement in the Central Valley, one that would build on the undergraduates' deep ties to their hometowns. "In the South in the early '60s, black voters were terrorized and intimidated. Voter suppression was deliberate and effective," said Terriquez. "In the Central Valley, part of the challenge is a lot of youth are the children of first-generation immigrants who don't have the right to vote. One of the strongest predictors of youth voting is whether their parents vote. We wanted to do peer-to-peer education to help build a culture that encourages young people to vote." 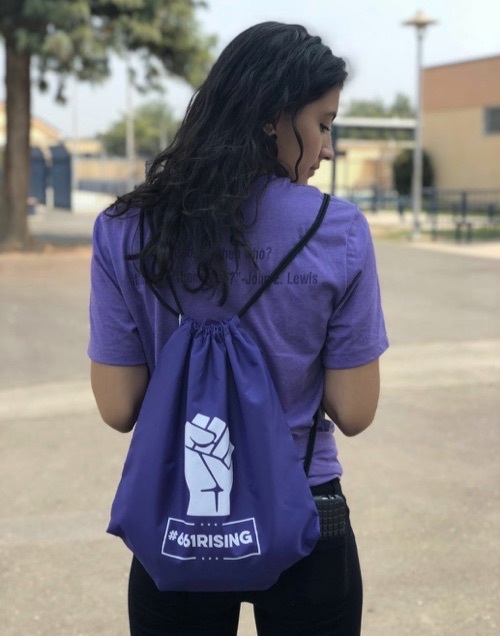 Central Valley Freedom Summer focused on registering young voters, who have one of the lowest turnout rates: just 16 percent of Californians aged 18-24 voted in the June 5 primary. "Schools rarely orient students to the voting process," said Terriquez. "Compared to places like Los Angeles and the Bay Area, educators in the Central Valley seem particularly reluctant to talk about elections and contentious issues that affect the community." Terriquez's research shows that voter education and civic engagement make a big difference in voter turnout, so the UCSC undergraduates, joined by six students from UC Merced, reached out to Central Valley youth in their schools and community centers. They talked about issues that resonate with youth: jobs, immigration, Black Lives Matter, LGBTQ rights, criminal justice reform, and environmental justice issues. They explained that every vote matters, bringing home the message with examples like the 10-year sales tax extension in the rural Central Valley town of Delano that passed in 2016—by just 66 votes. "It all gets back to the vote"
Jose Orellana is one of the UCSC undergraduates who went home to the Central Valley to register and energize voters. Orellana interned with the Center on Race, Poverty and the Environment in his hometown of Delano, one of the more liberal cities in the valley, best known as the birthplace of the United Farm Workers. Still, Orellana noted, turnout among young voters is in the single digits. "It all gets back to the vote," said Orellana. "All the problems—poverty, low education, the oil industry, unpaved streets, horrible air quality—it all goes back to the vote, because people aren't showing up. It's not that they don't care, it's that no one's educating them on these issues." Orellana and his UC Merced counterpart Lidia Gonzalez found it difficult to get into schools--which are on a year-round schedule--to talk about voter rights and to register, and preregister, voters. "People in Kern County, there's a lot of resistance," he said. "They're scared of our work, even though we're nonpartisan." So Orellana set about breaking down barriers, taking the lead on drafting a resolution for the Delano Joint Union High School Board called "Empowering and Preparing Young Voters." The resolution mandates that schools support voter-education efforts like Central Valley Freedom Summer's by allowing voting advocates onto campus, providing space and materials, and involving youth in Young Voter Committees. Board members unanimously approved the measure in early September. Orellana said it has been "amazing" to support Delano youth, who formed their own new youth organization, LOUD for Tomorrow, and advocated for the resolution as their first policy initiative. "I'm so proud," he said. "We're really growing and doing good work. Our students are so engaged and motivated for social change." The summer has changed Orellana's life, too. Like a lot of Central Valley kids, Orellana is the son of immigrants and the first in his family to go to college. He arrived at UCSC planning to major in business or a STEM subject. "It was unexpected for me to do this kind of work. I didn't go to marches or do community work or care about the environment," he said. "People say college changes people, and college changed me. I just started participating." Taking a class from Terriquez—"Doctor T," as some of her students call her—opened his eyes to how social change happens. "She was always telling us, 'Youth led the change,'" said Orellana, who is majoring in critical race and ethnic studies. This summer, Orellana learned to run meetings, speak to community leaders and elected officials, and knock on countless doors. "The hardest thing is getting rejection, when people don't want to talk with you," he said. "But there was nothing like this here before." Now, LOUD for Tomorrow has individual chapters in three high schools. 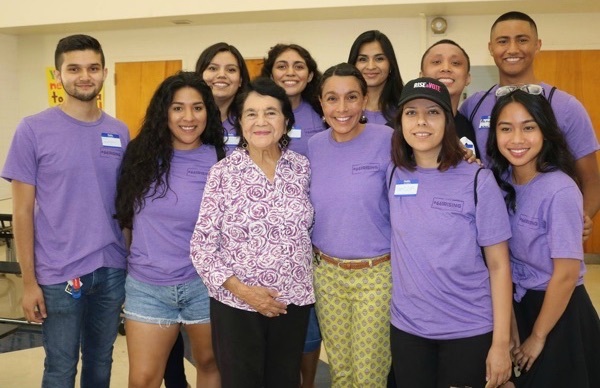 A highlight of the summer was when legendary activist Dolores Huerta made an unannounced appearance at a youth conference in Delano that Orellana organized. "It was such a surprise," said Orellana, who was at the podium when Huerta walked in. "I was so proud that she came to my conference." With two more years of college ahead of him, Orellana now sees a different future after graduation. He plans to return to the Central Valley and carry on the work he began this summer. "For me, this is not a short-term investment," he said. "I'm looking forward to getting grants and donors to continue this work and build our collective voice, our collective power. I have to come back for my community if I want it to change. We're in this for the long run." California is home to Hollywood and Silicon Valley, great surfing, and towering redwoods. But like the Golden Gate Bridge, most of the Golden State's most famous icons are coastal. Inland, the landscape is dominated by agriculture and oil rigs. From Stockton to Bakersfield, job opportunities are limited, public transportation is lacking, and graduates of K-12 schools say they don't do enough to prepare students for college. Levels of extreme poverty are high, and unemployment in poor neighborhoods approaches 20 percent; teen pregnancy rates are among the highest in the country; and agricultural chemicals have polluted much of the valley's groundwater, rendering the water undrinkable and sometimes hazardous even for bathing. All of this is contributing to what demographers call a "brain drain," as residents flee the Central Valley in pursuit of higher education and more opportunity. Which makes Orellana's determination to return to Delano significant. And he's not alone. Randy Villegas, a graduate student in politics at UCSC who supervised undergraduate participants in Central Valley Freedom Summer, was raised in Bakersfield. His own research focuses on identifying the best strategies to engage low-income youth and youth of color in community organizing and civic action, and he plans to write his dissertation about the Central Valley. Villegas watched young college students emerge as effective community leaders and as mentors to high school students. "It's very rare for them to see someone who looks like them who is at the UC level," Villegas said of the high school students. "This summer has inspired the kind of research I want to do, about communities that are often ignored." Many of the undergraduates have been transformed, he noted. They've gained skills in organizing, advocacy, media relations, and social science research. Each participant has taken detailed field notes on their experience to contribute to Terriquez's research. "I've seen a lot of growth," said Villegas. "It's been amazing to see how adaptable and resourceful they are, and how supportive they are of each other and the community they've built. They are inspiring these young students to make a difference." Students who thought they would never come back to the Central Valley "now have a different idea," said Villegas, who aspires to teach political science at Cal State Bakersfield—"or hopefully at UC Bakersfield." Roxanna Villalobos, who earned her B.A. in psychology and feminist studies from UCSC in 2012, returned to the campus as a doctoral student in sociology because she wanted to do community-based research in the Central Valley. Meeting Terriquez and joining the Central Valley Freedom Summer project was "a dream come true," she said. Villalobos grew up in the small town of Parlier outside of Fresno, raised by a single mother who worked in a produce packing house. After college, she earned a master's in gender and cultural studies and spent two years as a social worker in Boston. Coming home, she was struck by how little had changed. "The situation in the Central Valley isn't getting better for farm workers, in terms of pesticide exposure, arthritis, and asthma," she said. "I started to think that instead of running away from it, maybe I should come back and change the way things are." With support from private foundations, Central Valley Freedom Summer was able to provide a $4,000 stipend to undergraduate participants as compensation for their grassroots organizing and their internships. Community-based organizations are working on initiatives such as immigrant rights, pesticide reform, environmental justice and racism, reproductive justice, and access to clean water. Villalobos supervised 15 interns working in Visalia, Merced, Modesto, and Fresno. "Higher education wasn't widely available to the people I grew up with," said Villalobos, one of fewer than 10 students in her high school class of 200 who enrolled in a four-year college. "I saw doing well in high school as my ticket to getting out. I was told to take the SATs. Not everybody was. I was lucky to be given opportunities." Building the pipeline to higher education is part of the Central Valley Freedom Summer strategy. As part of a two-quarter course last year, UCSC undergraduates gained research and community-organizing skills. Over spring break, they returned to their hometowns to reach out to high school students and begin building the network they would engage with over the summer. A summer kickoff youth leadership summit at UC Merced, "Central Valley Rising," attracted over 100 young people. Seven smaller local conferences rolled out during the summer, each led by UC students in collaboration with high school partners. "This movement is being led by young people, for young people," said Villalobos. "Most of them had never been civically engaged. They had never seen it as cool. But Central Valley Freedom Summer offers community and support. It emphasizes the importance of getting civically engaged." Villalobos and Villegas will join Terriquez in analyzing the effectiveness of Central Valley Freedom Summer, including documenting barriers the students encountered and strategies they used to overcome them. "I've been really touched by how much the students learned," said Villalobos. "They see themselves continuing this work. They see the work that needs to be done, and they're capable leaders now. They are qualified to do something about it. They didn't see these opportunities before." Villalobos, whose research focuses on gender-based youth organizing, looks forward to being a professor and a role model for youth. "We don't have a lot of Latina professors from the Central Valley in the Central Valley," she said. UCSC undergraduate Rosanai Paniagua grew up in the small town of Richgrove, about 30 miles north of Bakersfield. She has been in on the Central Valley Freedom Summer since its inception. As a research assistant for Terriquez last summer, she remembers her professor asking what she thought about the idea. "I told her it sounded amazing," recalled Paniagua, who is majoring in sociology and Latin American and Latino studies. "We didn't have things like this." Paniagua helped organize the youth conference in Porterville, which attracted 40 people, including about 20 high school students. A more conservative town than Delano, Porterville was a challenging place to do outreach. "It was hard to get people to come out," she said. But the establishment of LOUD for Tomorrow more than made up for any disappointment she felt about her ability to draw big crowds. "The youth are so involved, and they've grown so much," she said. "They didn't know how involved you can be. They have found their voice." Paniagua knows a bit about finding one's voice. Her parents both worked in the fields for 30 years; her father drives a semi now. Paniagua, who has four older brothers, said the odds were stacked against all of them. "I don't know how we didn't fall into gangs or, for me, become a teen mother," she said. "I credit my mom. She made sure we weren't going to work in the fields. She wanted us to go to college." And they all did. Looking back on her education, Paniagua says, "Our schools aren't the best. Teachers just pass out worksheets. Two math teachers were just fired for incompetence. Our students deserve much more." Under the circumstances, perhaps it's no surprise that voter turnout is so low. Among Delano residents ages 18-24 years old, the numbers are telling. "Of 7,600 young people, only 1,800 are registered—and only half of those turned out to vote in 2016," said Paniagua. Paniagua feels strong ties to the Central Valley. "Even in high school, I thought I wanted to come back," she said. "I was made by my community. It made me who I am. My community deserves my return. I want to give back." As Terriquez tallied up impacts at the end of the summer—including more than 3,000 voters registered or preregistered—she expressed satisfaction with the effort. The summer produced ripple effects, large and small, that will be felt for years. "We know our effort was small, but it's a start," said Terriquez. "We want to understand what works so others can scale up this effort in the Central Valley and other places." After she and her research team analyze the results of Central Valley Freedom Summer, she anticipates publishing academic journal articles and taking their findings "on the road" to community-based organizations and philanthropists who support youth civic engagement. "We wanted to generate excitement around the election, particularly in areas where youth are not exposed to the importance of voting in their schools or their families," she said. "We got mixed results. It took some people by surprise, and some students were not welcome to do voter registration and education. People were a little skeptical." But Terriquez witnessed "real enthusiasm and an awakening" among young valley residents who attended youth conferences, summits, and workshops, or whose schools allowed Terriquez's team to share their message about the importance of exercising the right to vote. "Particularly in small and rural towns, many young people are not used to talking about voting as one way to help tackle local concerns," she said. "There's some reluctance to engage. But in the end, young people shared powerful testimony about how our work opened their eyes to policies that impact their community, how they came to imagine a better future for their community, and how excited they are about voting for the first time. They appreciated what we were doing."